If the systemically collapsing Democrats display even a fraction of the backbone that McConnell’s Republicans did with respect to Obama’s failed Merrick Garland nomination for this same seat, they can easily stop Gorsuch. King is hinting that he will vote for cloture but then vote against confirmation where the Republican’s majority in the Senate will prevail anyway. 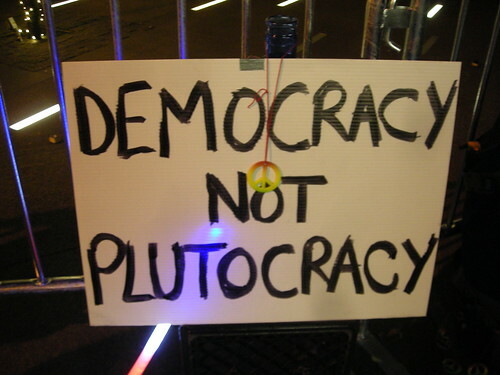 This would allow King to effectively vote for plutocracy in practice while pretending to vote against it in principle. This is pretty much routine for the fake opposition. So this is what should be expected from the spineless Democrats unless the public intervenes with something more effective than letter writing. Democrats only need 41 Senators out of 48 to sustain a filibuster by voting down cloture for the personable, pedigreed and talented Judge Gorsuch. Trump dredged him up from the corrupt Swamp he promised to drain, as he has all his other appointees, so far. By mustering 41 votes against cloture, Democrats will defeat the Gorsuch nomination unless Republicans change the rules to resort to the “nuclear option” of either repealing the anti-democratic filibuster rule or legitimizing a work around, as the price for his appointment. It is not at all clear that the Republicans have 50 Senators willing to change the rules. Some Republicans want to preserve the filibuster rule since over the long run it favors Republicans as the minority party. Even McConnell has said it will take 60 votes to confirm Gorsuch, which therefore returns us to an inspection of the Democrats’ spine. Trump complained that “Courts seem to be so political.” With Gorsuch he hypocritically nominated a thoroughly politicized judge to the Supreme Court whose extreme right wing politics have not changed since he was in high school. Because lower courts tend to follow precedent, and judicial supremacists on the Supreme Court do not, Gorsuch has not yet really begun to put his predictably right wing ideology into action from the bench. On the Circuit Court he has tended to achieve his ends by tinkering with procedure. But he was chosen because there is very little room for guesswork about what politics Gorsuch will pursue on the Supreme Court for the plutocracy. That he is a member who regularly speaks at events of the quasi-official commissariat for right-wing legal ideologues known as the Federalist Society saves progressives the tedium of parsing Gorsuch’s writings to determine his views. The well-funded commissariat has already done all the intensive vetting necessary to assure that Gorsuch will be no less reliable an ideologue than Scalia, Roberts and Alito, who were similarly approved and groomed for the purpose of serving the plutocracy. As Sen. Blumenthal (D-CT) said: ““The wholesale outsourcing of nominee selection to interest groups is without known precedent, especially for a position as important as associate justice of the Supreme Court.” This alone is sufficient reason to vote against Gorsuch. One of the more reliable reporters on the Supreme Court beat, Charlie Savage, reports that one of the highly litigious, multi-billionaire funders of he Federalist Society directly intervened through his attorney with George W. Bush to appoint Gorsuch — who was then serving as his outside corporate counsel — to his current judgeship. That this particular plutocrat continues to have financial ties to Gorsuch reverts to the practices of Gilded Age plutocracy. Then lawyers directly identified with specific interests were appointed to the Supreme Court. The vote for cloture that King is contemplating, along with Democrats like Manchin, Tester, McCaskill, and others would deny that having Gorsuch on the Court would be worse for the country than not having any new judge on the Court at all. This is the choice Republicans made about Garland, and thereby established a new standard for Senate confirmation of Supreme Court nominees. The new political standard for denying a president’s choice does not require any Supreme Court nominee to be even considered that does not meet the Senate’s political test. The decision to block a nominee is therefore not a reflection on the personality or elite credentials or other “qualifications” of the nominee, since Garland’s were just as exemplary as are Gorsuch’s. The decision focuses solely on the politics of the nominee, particularly on the essential issue of the country’s failing democracy and ruling plutocracy. Predictably, the plutocratic wing of the Democratic party produces supporting propaganda for failure to filibuster. The Bezos Post, published an article warning about the “danger of a politicized judiciary” if the Democrats adopt the new standard, ignoring that the new standard represents an honest acknowledgment of the reality that the Supreme Court is not only already fully politicized but also weaponized for class war by its judicial supremacy ideology. The usual party operative argue that Democrats should apply the old standard and defer to Trump’s nomination. These Democrats do not want to acknowledge that their vote on a Supreme Court nominee is a political vote, because that would strip them of an excuse for giving their usual decisive support to the plutocracy they work for, behind the windowdressing, in this case, that it is only a responsible and principled non-partisan vote about character and credentials to be a justice. Check your wallet when a politician or propagandist pretends to be non-partisan. A variation of this propaganda from the same source can be paraphrased as saying that the Democrats should defer to a permanent extreme right wing majority by confirming Gorsuch and only contest the next seat likely to be vacated by one the permanent minority of liberals on the bench. This faction of the Democrats prefers to be ruled by a permanent majority of plutocratic judicial supremacists. But to disguise that fact, at key historic junctures, they pull out of the air such idiotic “principles” to justify conceding power to Republicans as this one. Here they claim it will be useful to keep their powder dry for some mythical future when they will fight for progressive values. There has never been, at any previous time in American history, a Supreme Court appointment that would be worse for the republic than Gorsuch would be right now. None in the past would have been more decisive in perpetuating plutocracy and drowning democracy in the systemic Swamp of corruption that now dominates U.S. politics. The Roberts 5 constituted a menace to American democracy for a decade, as the most plutocratic, corrupting, right wing Court majority since Dred Scott. Their profound damage to the Constitution by 5-4 decisions in cases like Shelby County ‘s evisceration of the Voting Rights Act and their line of pro-corruption decisions, was only interrupted by Justice Scalia’s death last year. None of the Roberts 5 had inadequate legal credentials, mostly from elite law schools, or otherwise defective resumes. Yet they have committed what Chief Justice John Marshall called “treason to the Constitution” for political reasons. The Court’s current 4-4 deadlock between this extreme right wing political faction and moderate liberals, which was gained from Scalia’s departure, has provided the only bright spot in the failed politics of 2016. The ideologically neutralized Supreme Court has created some space for the ideologically balanced lower federal courts to furnish some geographically scattered respite for relative sanity compared to the rest of the federal government. This modest little flame celebrating checks and balances against the descending political darkness will be extinguished if Trump is allowed to fill the Scalia seat with yet another extreme and effective right-wing politician straight out of the plutocratic Swamp of Federalist Society ideologues. Such a nomination will only compound Obama’s strategic failure to fill the seat with a clearly progressive recess appointee when he had the chance. Gorsuch is even worse than Scalia and probably even worse than Roberts too, because smarter, a better writer, and personally more polished and likable in service of his right wing politics. It would be difficult to find a worse nominee to break this Court’s current ideological impasse. Any Senator who votes for cloture needs to understand in advance that they are going to face a campaign by progressives to remove them from office at the next primary or general election on the basis of this single vote. It can be safely predicted that no other vote prior to the 2018 election, other than for war or another similar Supreme Court nominee, will be more consequential than the Gorsuch cloture vote. The party’s plutocratic faction has already seriously undermined the Democratic Party by taking the risk of nominating the weaker presidential candidate in 2016 in order to preserve their corrupt control over the party. Democrats will define their utility as an opposition party on the basis of this Supreme Court appointment. If they cannot muster the 41 votes to defeat cloture then they are not worth retaining in the Senate at all. It would be better to clean the slate. This zeal on the right is unsurprising because the Gorsuch nomination will determine whether the Swamp’s systemic plutocratic corruption will be perpetuated, most likely for decades. As data from one study shows, in 2014 for example, “through neoliberal income re-distribution policies, 1980-2014 …. every nine adults in the bottom 90% contributed a total of $61,200 to each individual in the top 10%” compared to what they would have received if everyone shared equally in growth. Those redistribution policies bought within the plutocratic system maintained by the Supreme Court. Among his other outstanding qualities for the plutocracy, Gorsuch, at 49, is also relatively young for a Supreme Court Justice. Democrats are pretending that, contrary to the Republicans who are mounting “the most robust campaign for a Supreme Court nominee in history,” they know better – that this is not an important nomination. They can keep their powder dry for the next one. The reason is that the money invested by plutocrats in this campaign will be negative ads against vulnerable Democratic senators who therefore are inclined to invent any excuse to lay low on the Gorsuch nomination, like anything else important to the plutocracy. Progressive and Independent voters who punished Democrats in 2016 for nominating a plutocrat like Clinton to lead them, especially, need to let it be known that a cloture vote for Gorsuch, or any other future Federalist Society nominee, will be a similar deal-breaker with the Senate Democrats. The impact of a Gorsuch appointment on further entrenching plutocratic corruption will be even greater than would have been electing Clinton for four years. Just as Clinton was vulnerable, Democratic Senators from an unusually vulnerable 25 states are up for reelection in 2018. If they can be influenced by money form the right wing to perpetuate the system where such money has influence, then they are useless to maintain in office. Progressives should make it clear they will not just stay home this time, as is reported to have been a decisive factor in 2016. They need to find a way to give collective notice that they will vote in the primary and general election to defeat any Senator who fails to filibuster Gorsuch. This is too important a juncture in history to employ half measures. Senator King is one of those 25 up for reelection in 2018. On March 5, he faced a town hall crowd critical of his vacillation about their demand that he prevent Gorsuch from becoming the fifth horseman needed to resume the Roberts Court ride toward the plutocratic apocalypse. Their demand needs to be turned into a clear litmus test of how a known number of such voters will treat King at next year’s polls if he votes for cloture. Independents fled from Clinton, thinking Trump was a better bet to drain the Swamp, or at least no less likely to do so than was the Clinton political ring. As Ralph Nader pointed out, Trump also “hijacked the progressive agenda” even beyond his fake promise to drain the Swamp. But now that Trump has revealed his true Swamp colors with uniformly plutocratic nominees and corporate giveaways, these voters who now know they were lied to by Trump should make the same demand about Gorsuch from the Republicans. They would only need to influence 2 or 3 Republican Senators from swing states to make the difference. Flipping any Republicans makes the Democrats’ betrayal more difficult. The right vote to rescue democracy from the Swamp is “no” on cloture for the Gorsuch filibuster. Any Senator who has a different priority than rescuing democracy from the current corrupt plutocracy that they serve should be removed to make way for progress. Restoration of democracy should be a non-partisan American principle. Voting for cloture is the most significant possible way right now for corrupt politicians of both parties to keep the Swamp rising. Such a vote by Democrats could conclude the Party’s self-destructive freefall towards oblivion. Such a vote would be final proof that the existence of two plutocratic parties has become as redundant as two pro-slavery parties were in 1856. One of them must go to make any progress. The plutocrat Democrats unnecessarily made the 2016 election a toss-up as to which party that would be, and those Democrats lost the toss. Americans generally comprehend the Roberts Court’s serial violations of the constitutional separation of powers in its pro-corruption decisions. Their decisions imposing a corrupt plutocracy on the country by overturning a variety of state and federal anti-corruption laws remain in force under the deadlocked Court. They will either rise – to inflict even worse damage on the country – or fall, to rescue the country from plutocracy, depending on whether the Senate approves what the Republicans call a “strict constructionist” to take Scalia’s seat. The Republicans’ contrarian, if not incoherently subjective, definition of “strict construction” is the opposite of its historic meaning when Nixon started using the term in the 1960’s. Nixon presumably invoked justices like Oliver Wendell Holmes, or Felix Frankfurter, who followed venerable constitutional rules – such as “the doubtful case“ rule and the “political question” doctrine – for limiting the Court’s exercise of judicial review powers, so as to maintain proper democratic deference to the elected, political branches of government. Whether or not Nixon and virtually every Republican after him who used this concept to describe their judicial nominees were familiar with these separation of powers rules, these rules define the intricate boundaries between the narrowly prescribed circumstances for legitimate judicial review of legislation and the far too frequently exercised illegitimate judicial supremacy on matters, like elections and political corruption, that fall outside the scope of the constitutional powers assigned to the judicial branch. It is the legislature that was given the power to regulate and judge elections for the purpose of assuring they do not deteriorate into instruments of corruption. The separation of powers rules provide the only legitimate source for giving the Court any objective application to the concept of “strict construction.” This phrase and its various cognates can only meaningfully refer to strict judicial adherence to the traditional rules denying constitutionally illegitimate political powers to the judiciary to make law. Republican appointees like Scalia, Roberts, Alito and their judicial supremacist predecessors and colleagues have been exercising such political powers since 1976 in blatant violation of the separation of powers rules. See Keck (2005). The founders considered such violation the straightest path to tyranny. Gorsuch will vote to continue plutocratic corruption. A true “strict constructionist” like, for example, the former Justice Stevens would not overturn anti-corruption legislation, such as the limits that McCain-Feingold placed on corporate independent expenditures involved in Citizens United, or its regulation of the unlimited expenditures on sham corporate issue ads which were legalized in the even worse, though lesser known, FEC v. Wisconsin Right to Life, Inc. (2007). Gorsuch is not a “strict constructionist” because like any other Federalist Society member he will vote eagerly to overturn any such laws that significantly threaten the rule of plutocrats. For 40 years Republicans have failed to find an accurate replacement for Nixon’s “strict constructionist” concept. It was suited to Republican strategy of a previous era, but no longer describes their changed criteria for selecting activist right wing political justices. If they were honest, Republicans would describe their new Federalist Society criteria for selecting justices as “plutocratic judicial supremacy,” which includes in one phrase both of their governing ideologies, a government on the auction block under infallible Supreme Court pro-corruption rulings. Questioning of Gorsuch in the confirmation hearings should probe this paradox of terminology to determine which term best fits his own judicial philosophy. Judge Gorsuch is known for taking a distinctly judicial supremacist view of executive authority in his criticism of what is known as the “Chevron” doctrine, a somewhat significant separation of powers rule which requires judicial deference to executive agencies’ expert interpretations of their governing statute. That Gorsuch would give somewhat less such deference than the governing rule advises is not of any great specific importance to the republic. But it does provide an indication of his tendency toward judicial supremacy in other areas, which is of very great general importance. Judicial supremacy, the opposite of strict construction, is of the greatest importance for explaining the Supreme Court’s alchemical conversion of money spent for the benefit of influence peddlers into constitutionally immunized speech – by no more than its own political diktat. This widely unpopular legislation from the bench has completely transformed politics in the U.S.
From a middling democracy with a great deal of individual political corruption in high places, but nevertheless enjoying historic growth of both economic equality and political equality prior to 1976, the Court’s Buckley decision and its progeny have since then turned the country into a systemically corrupt plutocracy with its many dysfunctional symptoms. Among others, the plutocracy’s growing inequality and social hierarchy has caused a new civil rights crisis that diverts energies into various symbolic pressure release valves by which the plutocrat wing of the Democrats creates diversions from focus on its own corruption. The Court’s bizarre judicial supremacist alchemy of turning money into speech has, ever since Buckley v Valeo (1976) invented it, caused, in addition to political inequality and extreme economic disparity, numerous impending vectors of collapse. Catastrophic threats loom over all areas of public life and commons that have been reduced to dysfunctional profit centers for the ruling plutocracy, such as by financializing the economy for Wall Street profit, globalizing trade for Wal-Mart profit, despoiling the environment for industrial profit, commercializing health care for insurance and big pharma profit, carbonizing the climate for petrochemical profit, and war-profiteering for the MIC, to name just a few of the major profit centers that kick back their share to politicians for their licenses to kill. The influence peddlers and their corrupt duopoly make it all possible for a price, without regard for future consequences. The catastrophic legalization of political corruption since Buckley, enforced and expanded through a series of largely 5 to 4 decisions, now hinges on this single appointment of Justice Scalia‘s replacement. As another New England Senator said recently, “if we can solve the problem of special interest money in government a lot of other things start to get right very very quickly.” Conversely a Neil Gorsuch appointment to this decisive fifth, tie-breaking, Supreme Court seat will only perpetuate and further entrench the problem of special interest money, thereby assuring that many “things” go more wrong even more quickly. There are few paths away from plutocracy that do not lead through the Supreme Court, the Swamp’s official gatekeeper and pro-corruption hydrologist. Gorsuch clerked for perhaps the most consequential movement conservative to preside over a lower federal court, Chief Judge Sentelle. Among several similar pro-corruption cases which he managed as Chief Judge of the influential DC Circuit, Sentelle most significantly wrote the SpeechNow.org (2010) decision that released unlimited SuperPAC spending. Because SpeechNow.org legalized unlimited independent expenditures from any source, this was actually the large nail in the coffin of democracy for which Citizens United incorrectly gets blamed, though it only legalized corporate independent expenditures of a negligible amount. There is no doubt that Gorsuch, like his judicial mentor, will vote on the Supreme Court in favor of continuing and expanding the Buckley line of plutocratic decisions and therefore side against the four dissenting judges who have generally opposed those decisions in cases like Wisconsin Right to Life (2007)(legalizing sham issue ads), Citizens United, Arizona Free Enterprise Club (2011)(gutting public funding), and McCutcheon (2014)(immunity of parties for their conflicts of interest caused by undeniably influential aggregate contributions). In Riddle v. Hickenlooper, 742 F.3d 922 (10th Cir. 2014), Gorsuch, in a concurring opinion, flagged his support for the “money is speech” alchemy by endorsing the following several transformative propositions: “the act of contributing to political campaigns implicates a ‘basic constitutional freedom,’ one lying ‘at the foundation of a free society’ and enjoying a significant relationship to the right to speak and associate — both expressly protected First Amendment activities.” This is the language used by plutocratic judicial supremacists. Gorsuch invoked it in a case which evaluated a euphemism for judicial supremacist power, the “various tiers of scrutiny” to be applied by supremacists to protect the fundamental equal “right” to make political investments in violation of anti-corruption laws. Monetizing the First Amendment by means of “significant relationship” in this manner rationalizes the judicial veto of anti-corruption legislation which is designed to defend democracy from the systemic conflict of interest corruption by which plutocrats corrode and topple popular sovereignty. At the same time Gorsuch endorses such judicial supremacist views to usurp power from the elected branches over what are clearly political and not judicial questions under the venerable separation of powers rules, he and his plutocratic supporters paradoxically claim he is a “strict constructionist” – the very opposite of the judicial supremacist he clearly is. Like CJ Roberts and his fraudulent umpire meme to disguise his judicial supremacist ideology, Judge Gorsuch wrote his own “strict constructionist” ritual vows for his nomination ceremony. He assured the public at his first opportunity, “it is for Congress and not the courts to write new laws. It is the role of judges to apply, not alter, the work of the people’s representatives.” This ritualized demurral by nominated judicial supremacists does not describe what Gorsuch has done when endorsing the supremacist concept that money is speech, or granting corporations religious rights in Hobby Lobby, or decided other cases restricting women‘s rights. Identity hierarchies and plutocracy are inseparable strategies for a politicized right wing operative like Gorsuch. Such paradoxical reasoning of pretending a judicial supremacist is actually the opposite, a “strict constructionist,” has been going on a long time. George Bush II sang from this same dissonant songbook for his second of two disastrous judicial supremacist appointees: “Sam Alito is a brilliant and fair-minded judge who strictly interprets the Constitution and laws and does not legislate from the bench.” This is the same lie we heard about Roberts and will be hearing from and about Gorsuch, who is cut from the same supremacist cloth as Alito, though he may be more effective and ingratiating in pretending he is not than was the stiff and evasive Alito. The Democrats’ minority leader, Charles Schumer. figured out the stealth nomination fraud long ago and promised at that time to prevent the Constitutional harm the Roberts faction would cause if “joined by just one more ideological ally. I will do everything in my power to prevent that from happening,” he said. Now that Schumer has the power to enforce solidarity by the Senate Democrats, a great deal of the nation’s future turns on whether he keeps that promise. If the Democrats on the Judiciary Committee like Sheldon Whitehouse (D-RI) or Al Franken (D-MN) do not explore deeply with Gorsuch what he thinks a strict constructionist is and how the concept relates to judicial supremacist decisions like Buckley and Citizens United, they will fail to do their job. The American public has at least a right to know that the Senate Democrats are about to approve another judicial supremacist on the Court to rule over them, and perpetuate plutocracy. Judge Gorsuch, you have been called a strict constructionist (some Republican will inevitably misuse the term, or some phrase close to it). What does strict construction mean to you? Is the ruling in Buckley, which Supreme Court Justice Byron “Whizzer” White described as enacting the “maxim that ‘money talks,’ .… that money is speech and that limiting the flow of money to the speaker violates the First Amendment,” an example of strict construction of the Constitution? Gorsuch clerked for Justice White and called him “one of the smartest and most courageous men I’ve ever known” who “brought me up in the law.” If Gorsuch were to find that he agreed with the reasoning of his mentor, as expressed in White’s persuasive dissent from Buckley, would Gorsuch feel free to vote, in a case that sought to rely on Buckley as precedent, to overrule that decision as wrongly decided? Does Gorsuch agree with White’s strong criticism of the rationale in Buckley that regulation of campaign finance is unconstitutional because it reduces the “communication made possible by” money? Is White not correct in arguing that this rationale is so absurd that it could also be used to overturn tax laws or nearly any law that can be argued to leave less money on the table which is supposed to be spent for speech, some of that money taking the form of illegal proceeds from any kind of crime, not just from the crime committed when campaigns receive money in violation of campaign finance laws in such amounts that reasonably can be ruled to create conflicts of interest. Did anyone other than Robin Hood and Buckley plutocrats ever make such an argument that a crime can be excused by the use of its proceeds for some judicially approved conduct, like buying political ads? Sen. King tried out a new songbook on his constituents when he gave Gorsuch credit for “independence,” as a euphemism for judicial supremacy. He tried convincing Democrats at his town hall meeting that judicial “independence” is a good thing, if used, in violation of the Chevron rule, to instruct the Trump administration how to govern in minor ways. This is a fresh example of how outrage against Trump is being exploited to divert attention away from addressing, as the Sanders’ campaign tried to do, the priority progressive issue of bi-partisan corruption of democracy. The plutocratic Democrat wing of the duopoly is playing its usual game of expecting the bounce of voters away from the plutocratic Republican wing will return those voters into their own embrace. Fear of Trump cannot justify supporting Democrats whose entrenchment in the same political corruption actually caused Trump’s victory. The failure to acknowledge Clinton’s perceived weakness on the priority concern if Swamp draining, a corrupted DNC process under undemocratic primary rules, and dishonesty about Sanders’ known superior strength against Trump with Independent and Progressive voters, are responsible for the unpopular Trump’s election. Why should those who deliberately took the risk of a clown being president be rewarded without any proper penance? By making the suggestion that Gorsuch’s judicial supremacist inclination to tell the executive branch what to do might justify a cloture vote, King was overlooking, or deliberately distracting attention from, the one essential issue that Democrats hope swing voters will ignore. King would invite Democrats to ignore their party leaders’ complicity in electing Trump and focus their anger solely at some relatively minor inconvenience to Trump as a reason, ironically, to support Trump’s own nominee, notwithstanding Gorsuch’s predictably fatal fifth vote for the exponentially more important issue of perpetuating the corrupt plutocracy in which both parties are mired. King demonstrates Chris Hedges’ dictum: “The party elites know that if corporate money disappears, so do they.” Is there any good reason for progressives not to vote against King and similar “party elites” if they join in placing Gorsuch on the Court by voting for cloture? Helping the extreme right Roberts 5 run the executive branch would hardly be an improvement over Trump’s running of it in any event. The Constitution’s separation of powers requires that, like it or not, the elected executive should take responsibility for running the executive branch just as the elected legislators should take responsibility for making the laws in the legislative branch. This leaves leverage in the hands of voters, where it belongs in a democracy, to kick out Trump and the politicians who support him who refuse to follow and enforce anti-corruption laws, and also kick out the legislators who refuse to enact those laws, including jurisdiction-stripping provisions. Allowing the Supreme Court to usurp such political power is a deceptive technique for politicians to avoid responsibility for serving plutocrats. Under the separation of powers, unelected judges, as recited in the fake Gorsuch vow, should stick to judging and not concoct constitutional excuses and alchemical formulas to veto laws or regulations for the benefit of plutocrats. This is why there have been developed since the earliest years of the republic elaborate separation of powers rules to prevent such judicial usurpation of political power, although they have been routinely ignored by supremacist judges like Gorsuch with impunity. As Jefferson rightly put it, the prospect of impeachment for such misconduct is “not even a scarecrow.” Therefore supremacists need to be identified and ferreted out prior to their appointment by “extreme vetting” and intelligent questioning in confirmation hearings. Any candidate who refuses to reject the most consequential judicial supremacist ruling of this plutocratic era, Buckley, should simply be eliminated from consideration for the job as an absolute democratic litmus test. If the politicians are unable to do it, then the people should. A successful filibuster of Gorsuch would force Trump to resort to his depleting stash of political capital before trying to appoint another right-wing Federalist Society nominee. Since none could be worse than Gorsuch, who is top of their list, this should count as victory. If, under pressure from progressives, Democrats persist in blocking such an appointment through to the 2018 election, under a cliff-hanging application of what Sen. McConnell called the “Biden rule,” they might eventually force Trump to appoint a moderate justice. Or they might not, since the election map suggests a narrow but possible Republican path to a filibuster-proof 60 Senator majority. If Democrats continue marginalizing progressive issues and voters they may just help achieve that unusual feat in their ongoing collapse. If they discover a backbone to fight the Gorsuch nomination they might win back some voters. An extension of Sen. McConnell’s “Biden rule” for an additional six months or so beyond its original time period of one “election year” in order to hold a referendum on Gorsuch in November 2018 would be justified because Trump blatantly lied to his voters about draining the Swamp. Elections have consequences when they actually guide actions. But Trump has done nothing but raise the Swamp, most importantly by nominating Gorsuch. The swing voters who elected Trump need to themselves decide whether Gorsuch is a Swamp raiser instead of the Swamp drainer they were entitled to expect to the branch that built the Swamp of systemic corruption in the first place, and now guards it from any intrusion of either integrity or democracy. Garland lost the comparable referendum that Sen. McConnell scheduled for him in 2016. His loss was justifiable since he, like Gorsuch, was also a plutocrat who had signaled his views on plutocracy by actually signing on to Sentelle’s opinion in SpeechNow.org. Obama tried to put his plutocrat nominee across in his slyly deceptive manner which is only stylistically different than Trump’s approach of outright lying by nominating his own Swampster, Gorsuch. Now the fact that Gorsuch may even be an improvement on Garland with respect to some rights of criminal defendants can be alleged as a point in his favor as if Garland provided a new lowered bar. This new bar allows the incredibly dumb proposal from a Democrat that it would be a compromise “deal” to agree to simultaneously appoint both plutocrats to the Court. There should be a Gorsuch referendum, whether Gorsuch is confirmed or not. If Democrats can stop, or delay any appointment until the 2018 election, they will have progressive support in that election to either vote against Gorsuch by voting Democrat or reward a Senate vote against cloture. If not, the Senators who fail to vote against cloture, will not have progressive support, and should instead have progressive opposition. Progressives need to remind Democrats that, either way, they have never succeeded in such elections over principle by capitulating to the right wing and continuing their 2016 program of alienating progressive voters. Compromise short of such a referendum is possible. There of course exist many ultra-conservative judges who, like Gorsuch, would vote against, on “strict construction” grounds, the liberal precedents, mostly on identity issues, they all dislike. But there are some of these who, unlike Gorsuch, would also have the intellectual honesty not to pretend that overturning anti-corruption laws is also “strict construction” of a Constitution in which no honest search can uncover any formulas for turning money into speech. For example, a book on constitutional interpretation by Harvard professor Adrian Vermeule, Judging under uncertainty: an institutional theory of legal interpretation (2006), suggests he might have such integrity to consistently reject all forms of judicial supremacy. Vermeule’s book argues the case for an intellectually honest rule that would consistently prohibit judges from exceeding the scope of their expertise and function by interpreting any of the vague political concepts in the Constitution, whether they get political results they like under such a rule or not. He warns “to license good decisions is to license bad ones as well.” id. 280. There are strong reasons for liberals as well as progressives to oppose Gorsuch. Since Senators like King are softening up their liberal supporters to accept the lose-lose of the Republican hypocrisy that Gorsuch represents, it would be worthwhile to make them instead force Trump to provide at least the kind of win-lose compromise on the kind of consistency that a Vermeule nomination would offer. Liberals would not like Vermeule. Seventh Circuit Judge Posner, who is considered extremely conservative himself, has labeled “Adrian Vermeule … well to the right.” Vermeule, like Gorsuch, also clerked both for David Sentelle and for one of the supremacist Roberts 5, Scalia. It is not clear how Vermeule would treat the rights of vulnerable groups. By nominating Vermeule, or a consistent “strict constructionist” like him, Trump would likely satisfy his right wing base, while at the same time keep faith with the “drain the Swamp” swing voters who actually elected him, but who are now driving his favorability ratings under water. Trump repeatedly said “It is time to drain the swamp in Washington, D.C.” and “end our government corruption.” Trump thus deceptively invoked the truth to make people believe that his actions will be guided by it. He made this theme a centerpiece of his Inaugural speech in order to stanch the rapid exit of former supporters based on his plutocratic transition. But his promise to drain the Swamp simply cannot happen if the Supreme Court’s rulings that caused the systemic corruption in the first place, by legalizing the money that creates conflicts of interest, are only perpetuated by confirming Gorsuch. A win-lose nominee would be a compromise that Trump might consider in his own interest. As H.L. Mencken said: “It is [a politician’s] business to get and hold his job at all costs. If he can hold it by lying, he will hold it by lying; if lying peters out, he will try to hold it by embracing new truths.” Trump’s lying about draining the Swamp makes him vulnerable with his own voters. A win-win for both liberals and progressives in this nomination would require the unlikely feat of Democrats growing a real spine and embracing majoritarian progressive values that can actually win elections. That is not going to happen until the Buckley plutocracy is overthrown and authentic democracy can be used routinely to obtain the politicians and policies that the majority desires rather than those the plutocracy has bought. The straightest path to that goal, by overturning Buckley, is to block Gorsuch in favor of, at the very least, a consistent “strict constructionist.” The minority leader Chuck Schumer agrees that Gorsuch has an “ideological approach to jurisprudence that makes me skeptical that he can be a strong, independent justice on the Court.” This states the problem. The question is whether Schumer will use his powers to enforce party discipline for the solution, a firm 41 votes against cloture for this ideologue nominee. * This article is based on the author’s most recent book, “Strategy for Democracy: Why And How To Get Money Out of Politics,” which is currently available as a free ebook. This is part of a multi-volume study assessing strategies for ending the political influence of special interest money that especially critiques the dominant Democratic liberal meme of endless advocacy for constitutional amendment and other piecemeal reforms, while presenting easier and more effective alternatives. See “The Amendment Diversion,” Bk. I. Rob Hager‘s most recent book, Strategy for Democracy: Why And How To Get Money Out of Politics, is currently available as a free ebook. This entry was posted in All Posts News Politics and-or Videos, Democrats, Politics, Propaganda, Republicans and tagged Angus King, Citizens United, Donald Trump, Duopoly, Neil Gorsuch, Plutocracy, Rightwing, Rob Hager, Same As It Ever Was, Supreme Court. Bookmark the permalink. In the end, the “new standard” could mean the demise of the Supreme Court because it makes it almost impossible to ever confirm a justice. Sounds a lot like Bannon’s deconstruction approach, which I don’t agree with.